The Asics 2150 is a shoe you can bring home to momma. It’s just about everything a running shoe should be plus it only gets better with time. Right out of the box these shoes are a little stiff. Give them a few runs to break in. It seems it takes 20 miles or so before they lose that stiffness. After 40 miles they have that comfortable feel good goodness to them. There is a reason why theses shoes are the category leader, for at least the last 10 years or so. I’ve been a big fan of their 20xx and 21xx line up as you can see from the family portrait I took of my last three pairs of this shoe family. What’s good about these shoes? They hold up well, they run well and more importantly they run well over a wide variety of terrain from rocky trails to crushed dirt and gravel paths to concrete. They fit well, although people with high arched, high volume feet may find they have to play with the lacing system some. Moderate pronators will be happy with the double density midsole for control. You can get a lot of miles out of these shoes. I probably average just north of 400 miles per pair before I demote them to grocery store/dog walking shoes. What’s not to like about these shoes? The long answer is not much. If I could change anything, and this seems to be a theme on all of my Asics running shoes of late, it would be the laces. I’d make them a bit longer and I’d make them so they stayed tied. If you have high volume feet, like I do, you will find out there isn’t much left over to tie your shoes with. 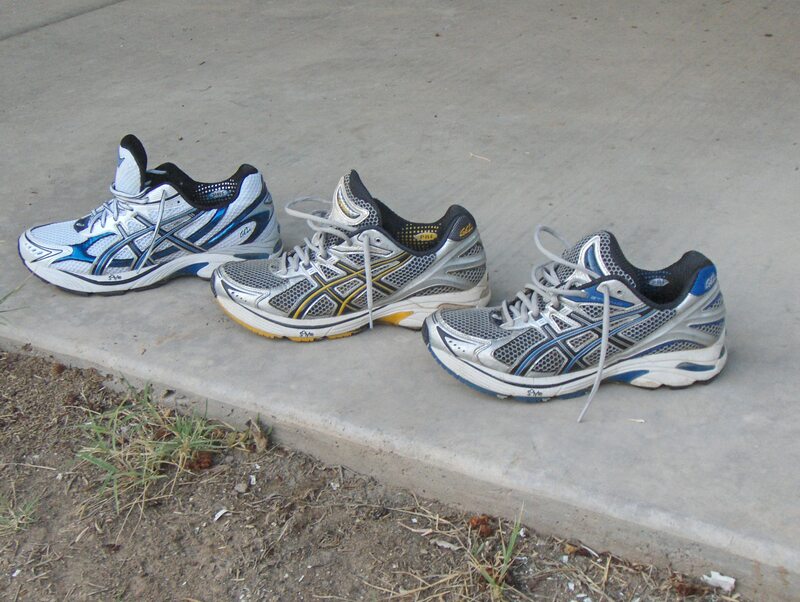 You might also find out, as I do for about a third of my runs, that one or both of my shoes come untied. It is annoying to have to stop at some point that doesn’t involve one of the two traffic lights I encounter on my usual run. It’s not a deal breaker to me. Year after year, the 2100 line gets it’s annual update, the 2160 is the latest model, and year after year it’s a damn fine running shoe that will meet a lot of runners needs and wants. oh well, big flipper feet are good for swimming. Mild to moderate pronators beware: these shoes (the newer models in the series) have more stability than you might think. I learned this the hard (PAINFUL) way. 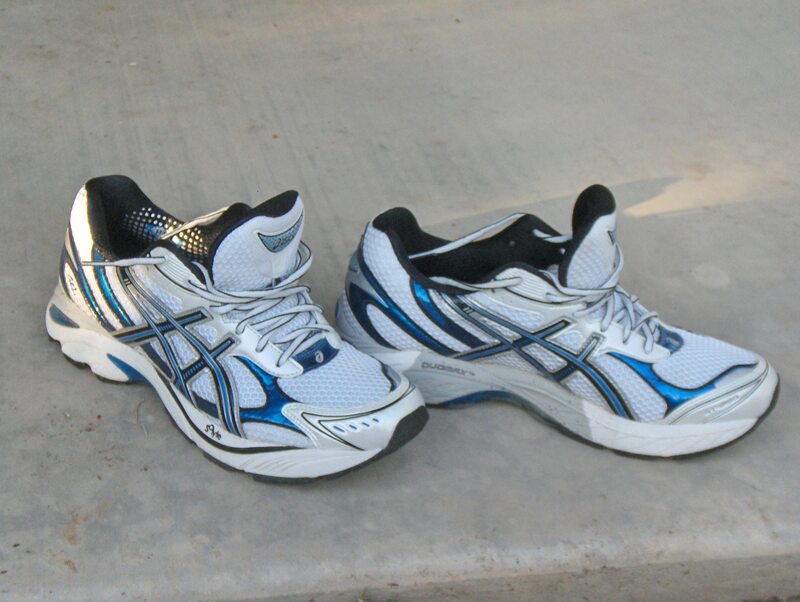 1100 series for me – if I still wore Asics. I believe they are keeping the 2150’s for this reason, or so I just found out. Hey when you tie your shoes, go around the bow twice before you make the second bow and they will stay tied. Secret from the someone who has taught over 100 kids to tie their shoes so they don’t come untied.